Sure that one sells sea shells – Where Is My Teaspoon? Hump day. Actually, it’s a bit sad to be counting down the days of the week every week. Surely if we all loved our lives we wouldn’t care if it was the weekend or not, yet here we are. This week has been busy enough so far actually. I mentioned before that I have been studying for a diploma part time and yesterday was actually an exam day for me. Talk about nerves..I was a lot more nervous than I had been for previous exams but I think that might be down to the fact that my company are sponsoring me to do them and that adds a little pressure to it. I just did my best though and hope I’ve passed. The exam was in this place called Girton College which has red brick arched hallways all the way through the main building. I couldn’t take a snap as I left my phone in Tabitha but might get back for the gawk some other time. It really reminded me of a nun’s convent I once had a piano exam in and my time in Maynooth which is where I did my Undergraduate degree. There is a certain feeling you get sitting an exam though isn’t there? The rooms are big and old and have weird black out blinds on tall windows and everyone is kind of giddy but nervous at the same time. I actually kind of like it but am not sure the exam went well enough.The exam was 3 hours so I was exhausted after it but am happy to be 2/3 of the way through this diploma now – hard work does pay off..eventually (I hope)! 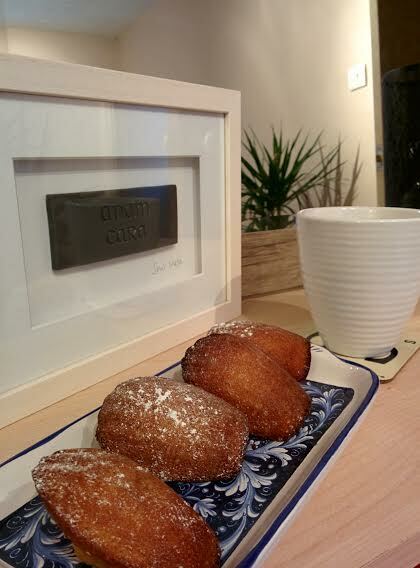 As promised many, many times I’m going to share a recipe for French Madeleines. I really think these look just like big sea shells – almost too pretty to eat! Have you seen that film Age of Adaline with Blake Lively? It has recently become one of my favourite Friday Night In Films as the clothes are to die for and it’s about the meaning of love and whether it can be the same if you can’t see a future. Anyway, in it she eats French Madeleines while looking through photographs and once I saw this scene I knew I needed to make them. I got my tin for £4 in TK Maxx randomly one day so am sure you’ll be able to find one to make them, They are such a lovely homemade gift and are sure to put a smile on anyone’s face. DO IT. I have added vanilla to mine instead of the rind of a lemon, just because not everyone here loves a lemon because they are so bittah. Kate Nash knows. I also think these would be good picnic food so it fits well with our April theme. Grease and flour your tin really well to make sure the little shells won’t stick when they are baked. Preheat the oven to 190g degrees. Whisk the eggs and the sugar together until they are light in colour and thick in texture. Sieve in half of the flour and gently but confidently fold it in. Pour half of your butter in against the side of the bowl. Now, gently fold this in. Follow with the rest of your flour, fold in and then finish folding in the rest of the butter. Spoon the mixture into the shell holes. They need to be filled about 3/4 of the way up. They’re going to puff up and look amazing. Bake for 8-10 minutes – make sure they don’t catch and burn. Turn them out of the tin and allow to cool slightly before giving them a light dusting of icing sugar. Traditionally these are dipped in tea when ate in France and are a really nice sweet treat. I’m going to experiment with these a bit more though so hopefully will be able to share some similar bakes with different flavours. Previous Post Do you even lift?